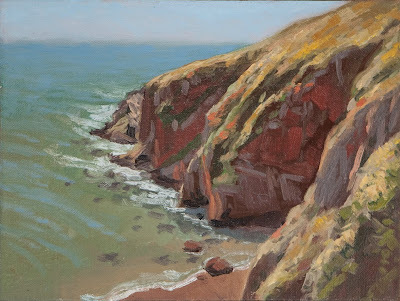 Yesterday, Ernesto, Bill and I went painting at the Point Reyes National Seashore. It was a sunny breezy day where the biggest challenge wasn't deciding what to paint, but finding a spot sheltered from the gale. The study above was on the lee side of the southern point of the headlands, on the north end of Drake's Bay. 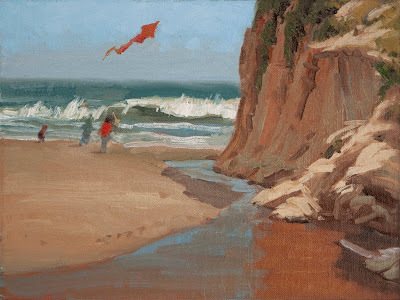 The cliff sides in this particular location had an intense red color, instead of the more typical pale tan, which was intriguing to paint juxtaposed with the teal water. Deer were abundant and there were also many elephant seals sunning themselves on the sand. Wildflowers were also still plentiful thanks to the late spring rains this year. The study below was on Drake's Beach, where most of the people were concentrated into a very small area of the beach, to the right, behind the cliffs in this view. Out of the wind, up against the cliffs, it was a tiny zone of balmy summer. Both studies are 8x6", Oil on Linen. The study above was on the southern point of the headlands, north end of Drake's Bay.It written a good manner and appreciated .